Daihatsu Hijet Shift Cable (4-Speed MT) S82, S83. OEM PN: 33530-87520 Only (8) Cables remaining in stock.Once Sold Out this item is discontinued. No further production planned. 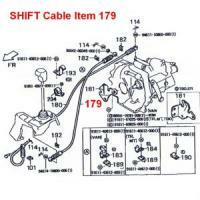 Daihatsu Hijet Shift Cable (4-Speed MT) S82, S83.